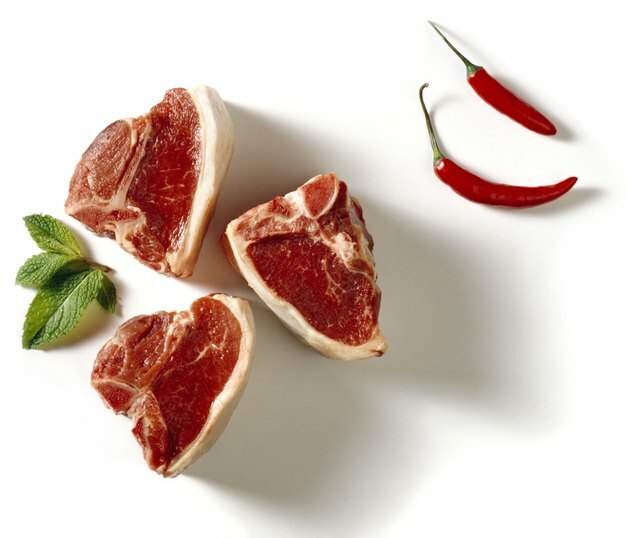 You might be inclined to make pork chops, but for an interesting alternative try lamb chops. However, lamb is fattier than some other meats with 18 g of fat, 7 of which are saturated, in a 3-oz. loin chop. The same serving size of a pork loin chop contains 9 g of fat and 3 g of saturated fat; a beef roast has 8 g of fat and 3 g of saturated fat; and skinless chicken contains 7 g of fat and 2 g of saturated fat. If you choose lamb, slow cooking is a delicious way to cook it. Spread the sliced onions evenly on the bottom of the slow cooker. Mix the salt, pepper, oregano, thyme and garlic powder in a small bowl. Spread this rub onto both sides of each lamb chop with your fingers. Lay the lamp chops on top of the onions in the slow cooker, and sprinkle the minced garlic cloves over them. Cook the lamp chops in the slow cooker for 5.5 to 6 hours on the high setting or 11 to 12 hours on the low setting, or until the meat is tender and falls apart easily. As an alternative, you can substitute chicken breasts, pork chops or a beef roast for the lamb in this recipe.